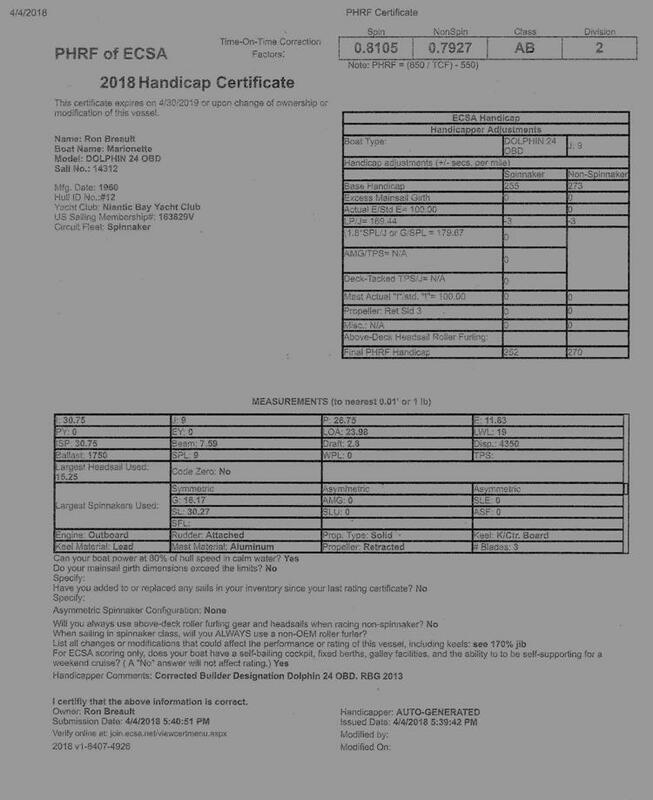 This certificate for Marionette is dated 2007, it has been 'identical', specification rating wise, through 2017. To get an idea how Marionette rates against her usual PHRF competition here is a results summary of one of her spinnaker races. 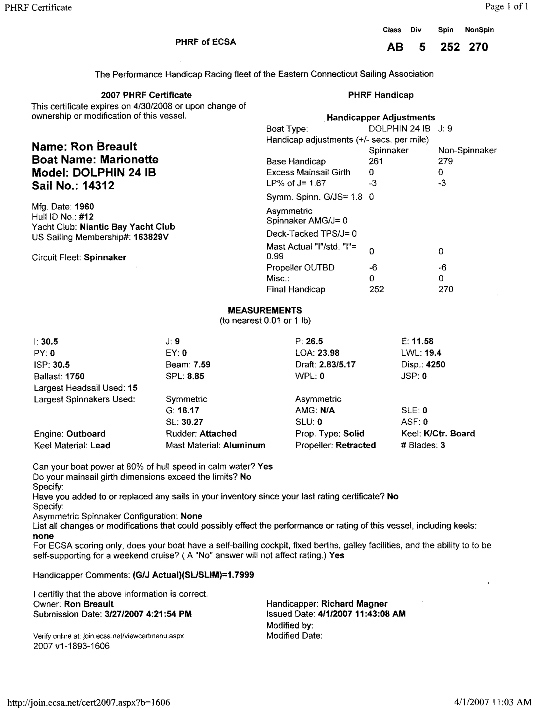 TCF (Time Correction Factor) is an Off Soundings Club rating assigned to each boat's actual finishing time based on each individual boat's PHRF rating, conversion from the Time on Distance (TOD) handicap system to a Time on Time (TOT) system, plus a penalty assigned based on recent race results. For example, in the above chart, Rusty Nail carried a 15% penalty on her rating of 176, giving her a revised effective rating of 176 - (.15x176) = 176 - 26.4 or 150. Watercolors PHRF of 208 is 44 seconds/mile lower than Marionette's so, for simplicity purposes, if the above race had a distance of about 18 miles the rating difference between the 2 boats is 13 minutes, 30 seconds. Watercolors' elapsed time of 3:37:46 was 5:19 better than Marionette's, but Marionette's rating advantage was 0:13:30 so Marionette won by 0:08:11 using TOD. She actually won by 0:06:55 using the TOT system.